Looking for some quick and easy ways to incorporate more superfoods into your diet? When I started my healing path, I took a good look at what I was eating, and how I could make some small changes (along with the big ones) to add more superfoods to my daily diet. I quickly realized that herbs would become an important part of my diet. Here’s a review of some of my favorites and quick tips for adding them to your diet, all of which I’ve compiled from books, websites and in-the-know friends. Just for desserts? Think again! Studies suggest that cinnamon may improve blood-glucose levels by increasing insulin sensitivity and significantly lowering blood-glucose levels. Studies have suggested that cinnamon improves blood cholesterol and triglyceride levels, since insulin plays a key role in regulating fats in the body. Cinnamon is also known for it’s obesity-fighting capabilities, so feel free to sprinkle cinnamon in your juices, on top of yams, etc. Simmer a whole cinnamon quill in soups or stews. Sprinkle cinnamon on apples, bananas, melons, and oranges. Combine equal parts cinnamon, cardamom and black pepper, and use as a rub for meats. Mix cinnamon into rice pilaf. Make spiced tea: put a quart of brewed tea into a pot, add 2 cups of apple juice, and gently simmer with a sliced lemon and two cinnamon sticks for 10 minutes. Add to freshly brewed coffee. Digestive aid: Researchers have found that coriander works like an anti-spasmodic drug, relaxing contracted digestive muscles that cause the discomfort of IBS and other “overactive gut” disorders. That same relaxing effect may be one reason why Coriander can help lower blood pressure too. Bloating, cholesterol problems, colic, colon cancer, type 2 diabetes, diarrhea, eczema, flatulence, high blood pressure, IBS, indigestion, insomnia, lead poisoning, liver disease, psoriasis, rosacea, stomach-ache, ulcer, vaginal yeast infection. Mix coriander seeds with peppercorns in your peppermill. 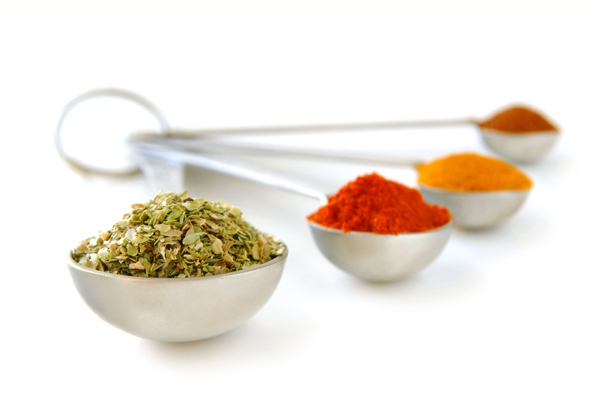 Coarsely grind coriander and rub it into meats or fish before cooking. Add whole or ground seeds to stews, casseroles, marinades, vinaigrettes and pickled dishes. Make a classic Moroccan rub: Mix ground coriander with garlic, butter and paprika, and rub it on lamb before roasting. Fennel is one of the few plants that has it all — it’s a vegetable, herb and spice. Fennel has also been shown to calm colic in babies, and studies have shows Fennel Seed helps reduce cramps and inflammation associated with menstrual cramps. Dry and crush toasted fennel seeds and steep them in tea. Fennel seed naturally complements many foods from the Mediterranean diet, including tomatoes, olives, olive oil, basil, grilled meat and seafood. Throw in extra fennel seeds the next time you make a sausage ragu or meat sauce. Add fennel seeds to fruit salads and compotes. Add ground fennel to scrambled eggs. Make spiced olives by marinating 2 cups olives in ½ cup extra-virgin olive oil and 1 teaspoon each of fennel seeds, dried oregano and dried thyme. Turmeric owes its preventive and curative characteristics to its active ingredient curcumin, a compound so diverse and powerfully rich in antioxidant and anti-inflammatory actions that thousands of studies have shown that it protects and improves the health of virtually every organ in the body. In fact, wide research shows that turmeric, taken as supplemental curcumin, is as effective and, in some cases, even more effective than pharmaceutical drugs — without their side effects. Before sautéing vegetables or making stir-fry, heat oil in a pan and sprinkle it with turmeric, stirring for a few seconds so it toasts a bit but doesn’t burn. Add turmeric to fried onions (one study found that onions and turmeric work together, synergistically, to protect against cancer). Use turmeric generously in lentil or dal dishes. Blend it in melted butter and drizzle over cooked vegetables. Add a teaspoon of turmeric to a large pot of chicken noodle soup. Add a teaspoon of turmeric to homemade chili. Eat more yellow mustard, which contains turmeric. For thousands of years, traditional healers worldwide have turned to ginger to help ease nausea of all kinds, and while we have all heard of drinking ginger ale for an upset stomach, it’s the actual ginger root that should be consumed to ease queasiness. Grate fresh ginger over cooked tofu, vegetables or soba noodles. Toss sliced or chopped ginger into stir-fries. Rub into meat before grilling to help tenderize and add flavor. Steep a coin-size piece of fresh ginger with your choice of tea. Sprinkle ground ginger and a little brown sugar on acorn squash or sweet potatoes before baking. Oregano. Oregano has anti-bacterial and anti-fungal punch, offers potentantioxidant thymol and acid called rosmarinic, and is a natural source of Omega-3 fatty acids. Basil. As in the case of rosemary, basil has anti-inflammatory and immune-boosting properties. This effect stems from eugenol, a volatile oil in basil that blocks enzymes in the body that cause swelling, making basil an ideal treatment for people with arthritis. Cayenne: cayenne pepper is quite remarkable. It offers, anti-irritant, anti-inflammatory, anti-cold/flu agent, anti-fungal, and anti-allergen properties. It also helps reduce migraine headaches and helps body’s digestive system. It prevents and treats blood clots while detoxing the body and supports weight loss. it should be part of your regular diet. Other suggested cooking tips: chopped fresh cilantro would be great with fresh summer melons and would be delicious combined with mint on a fruit salad too. A fresh fruit salsa with peaches, plums, pineapple, or melon would be great with cilantro. Pears poached in a broth of white wine or apple juice with dried coriander would be delicious and aromatic. To recap, turmeric, basil, cinnamon, thyme, saffron, and ginger are used for their immune-boosting power and garlic, mustard seed and chicory for their heart-pumping power. Coriander and cinnamon are recommended for their sugar regulating powers, and fortunately add a nice taste boost to foods! Once again, nature provides some incredibly healing superfoods for us, and as research continues to prove the medicinal powers of these and other superfoods, consider yourself lucky that you’re already ahead of the curve. You understand the power of food to heal us, and by following these quick tips here, you’re helping preserve and protect your body’s own healing powers.